A project goes like gangbusters. And that is precisely how this vest is going. 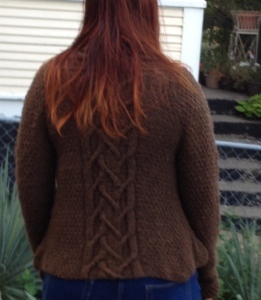 On Wednesday evening I finished the back. Thursday morning I was starting the first side. Thursday lunchtime I’d cast on all the additional stitches to make it a full side, and Thursday night I just knit and knit. If this keeps up, I might even have the second side started this weekend! So, this spindle thing? It is a bit of an obsession. I know, I know, I should be able to control my hobbies a bit better, but I cannot. So I finished up the Sid Fishious colorway, plyed up some of the undyed corriedale on the wheel, and then immediately decided to find something new for my spindle. What I chose was some of my own hand dyed fiber in a superwash merino. 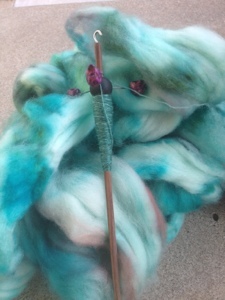 It is one of the nicer fibers I’ve dyed, it stayed lofty, silky, and wonderful. Now, I was a bit worried about this because I thought it might be a little too slick for me to spin well on a spindle. However, I’ve noticed that right from the start I’ve had better luck with the slicker fibers, and it has been the same for spindle spinning, I can tell already! And even better? With a splatter dyed fiber like this, I don’t even remotely have to worry about color progression. I love that! 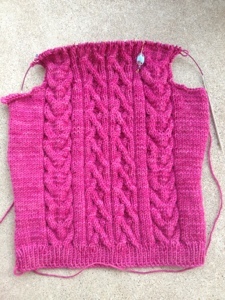 Despite having a nasty case of startitis and a desire to knit All The Things, my knitting time has been dedicated almost exclusively to the Cloud Chaser vest. I had this odd moment this morning where I wanted to bring the project to work, but also knew I’d need my completed vest to measure against and I didn’t want to haul that around too. Then I remembered that I could just…you know…wear my vest to work? Yeah, I am that thick from time to time. 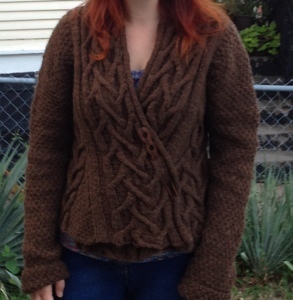 So, despite the fact that it was quite warm today, I wore a handknit. So, in addition to the spindle spun yarn I finished over the weekend, I also did a bit of wheel spinning. I needed more yarn for my featherweight cardigan and stat. So I spent a bit of time spinning more yesterday afternoon, plyed it up, washed it, and it was dry by this morning. 291 yards of 2 ply, and this one is slightly less felted than the last batch, but still has a fantastic bloom to it. If I wasn’t so busy with a vest or two, I’d be working on my featherweight! Oh, and of note is that I did indeed start yet another 4 oz. 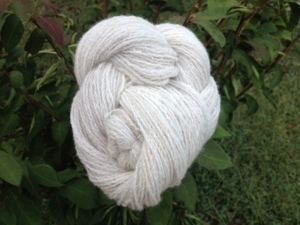 of superwash merino on the trindle! 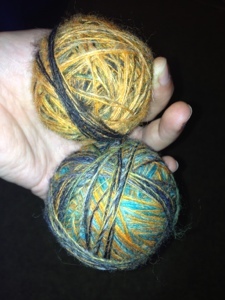 I managed to make yarn on my spindle. I did it! 350 yards of 2 ply fEnglish wool. The wool is the sid fishious colorway by dyeablical yarns. I didn’t do a whole lot of planning on how I wanted to colors to work, I just wanted to spin. So, once I had full spindles, I’d ball them up together and get on with the plying. Saturday evening I had 2 more balls of yarn. I then could not resist finishing them both. I just couldn’t. Stayed up a bit later than usual in order to finish, washed those two skeins this morning, and now I’ve got 3 not at all matching skeins of yarn. 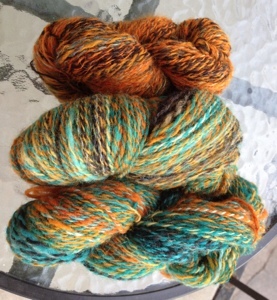 Because I didn’t worry about the colors, I ended up with one skein that is particularly halloween colored. 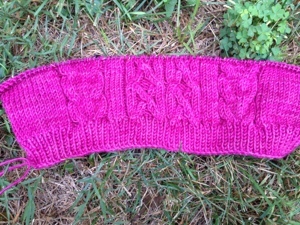 It gave me the idea of knitting a wingspan for halloween. We shall see if I have time for that! So, awhile back I committed to a trade, a yarn bowl for a cloud chaser vest. The yarn for it is blue moon fiber arts socks that rock heavyweight. 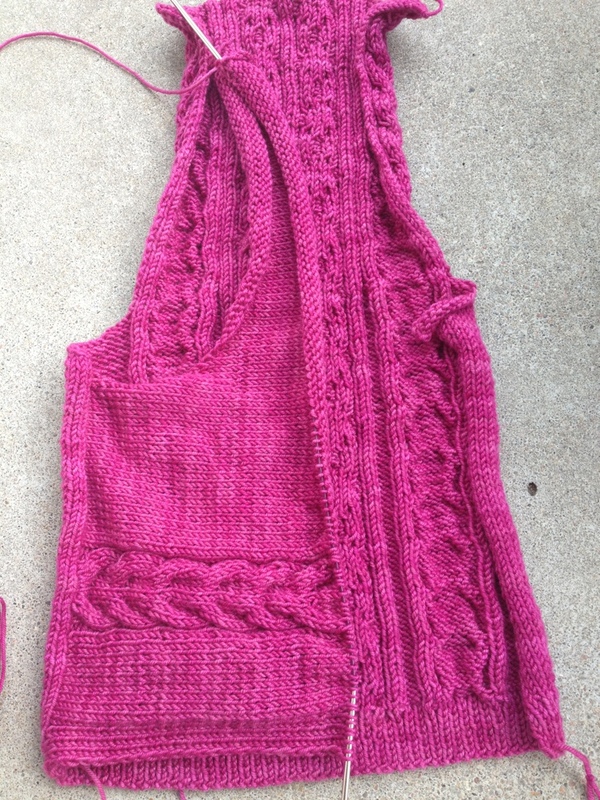 Because of this, the order took awhile to receive and in the meantime I was short on projects so I began another vest. The meadowlark vest. Of course, once the yarn came for the cloud chaser came in I wanted to start that too, leaving me with, for the first time, two vests on the needles at once.